With so much sameness, it’s not surprising that every casino in Vegas appears to have adopted some kind of gimmick to distinguish it from its neighbors. The Flamingo, for example, has a little outdoor area where you can find actual flamingos. You have to walk through the entire casino to get there — because casino designers consciously make you walk through the casino area to get anywhere — but you can find the real flamingos outside, going about their grooming and classy strutting without paying too much attention to the fact they they now live in an artificial habitat next to a casino where Donny and Marie Osmond perform. I feel sorry for the flamingos. 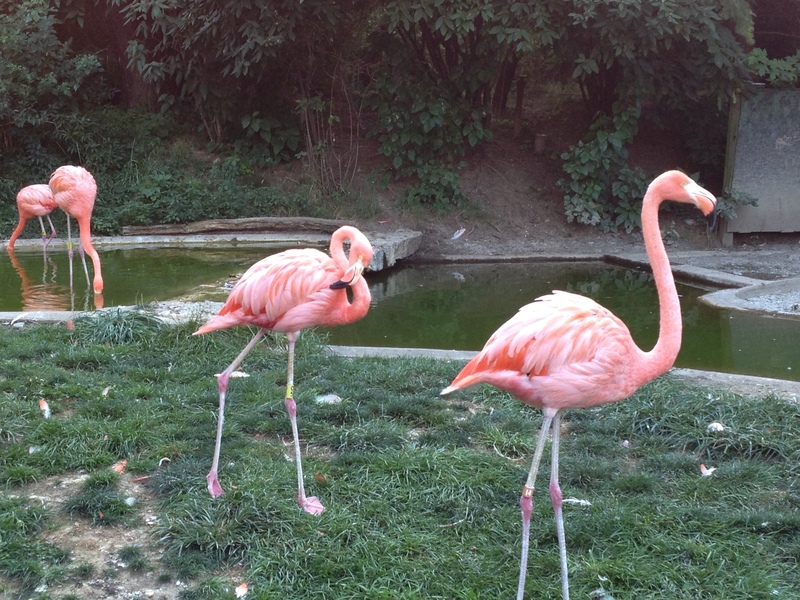 Our path to last night’s wedding reception at the Columbus Zoo and Aquarium took us past the flamingo enclosure. I haven’t been to the zoo in years — having kids who are grown will do that to you — and I had forgotten just how brightly colored and ungainly flamingos are. The birds pranced and preened, squawked, unscrolled their necks and dipped their beaks into the water, as I enjoyed the vivid pinks.